Despite diverging spheres of influence, Inga-3 could actually draw the two powers together. The U.S. and China have been seeking to raise and improve their respective profiles in Africa this week. The U.S. is interested in catching up with China, which became the continent’s largest trading partner five years ago, with trade reaching $200 billion last year, double U.S.-Africa trade. For its part, China is seeking to improve its image. Despite huge amounts of investment in Africa, China struggles with an image as an exploitative partner that seeks to extract the raw materials it needs in Africa without investing in projects to improve partner countries, or even use local labor. At the U.S.-Africa Business Forum in Washington D.C. on Tuesday, the U.S. announced plans to open 10 new trade missions on the continent, as well as $14 billion in investment from U.S. companies. Former President Bill Clinton also called for a 15-year extension to the African Growth and Opportunity Act, which offers preferential trade agreements to qualified African countries. The U.S. is intent on stemming its loss of influence in Sub-Saharan Africa by identifying U.S. companies to partner with African countries, like General Electric Co. and Ford Motor Co., which both announced plans for large investments at the forum. While the U.S. tries to resurrect its profile in Africa, China is seeking to improve its image while still stepping up its involvement. In May the governor of China’s central bank, Zhou Xiaochuan, admitted that, in regard to China’s history of investment in Africa, “Different entities have behaved differently. There may have been some phenomena of Chinese investors [that were] not so good, not so satisfactory.” That same month Premier Li Keqiang also acknowledged that the relationship between Africa and China had suffered “growing pains.” These two statements were the clearest signs yet that China’s leadership recognizes complaints by both its African partners and Western countries of “checkbook” diplomacy on the continent. This policy is characterized by China extending loans and investments to African countries which are then used to fund projects that facilitate the export of natural resources to China, often carried out by Chinese companies using Chinese labor. Beijing sought to counter this negative image in May by signing a deal with the African Development Bank for $2 billion that would award deals to the most suitable company, instead of just immediately defaulting to a Chinese firm. Even as China and the U.S. seek their own means to develop their spheres of influence, there is a project that offers a chance for the two powers to cooperate to their mutual benefit, and may actually require the participation of both of them to happen. This is the ambitious Inga-3 hydropower project in the Democratic Republic of Congo. According to the Financial Times, China actually approached the U.S. last year about collaborating on the project. The scale of the overall Grand Inga dam project is massive, with an estimated cost of $80 billion to generate as much as 40,000 MW of electricity. For comparison, this system of dams would generate twice as much energy as China’s Three Gorges Dam and a third of Africa’s current electricity production. The Inga-3 project alone would cost $12 billion and produce 4,500 MW of power. Given the cost, the remote location, and the technical challenge of completing such a project in one of the world’s least developed and most dysfunctional countries, the participation of both China and the U.S. is almost essential. Of the power generated by the dam, 2500 MW is expected to be bought by South Africa, 1,300 MW will be allocated to the DRC’s mining industry, and the remainder would largely go to the electricity grid in the capital of Kinshasa. Despite a $106 million grant from the World Bank and African Development Bank to fund an initial expansion and technical studies, the roadblocks to completion are substantial, the largest of which may be the country in which the project takes place. 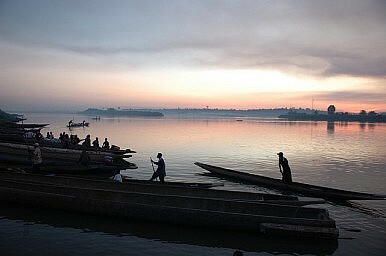 The DRC is the quintessential failed state: after more than a decade of civil war the government in Kinshasa is barely able to project power into its vast, undeveloped, and poorly connected hinterland. The country’s history of politicians making themselves rich off large projects while the projects themselves end up in ruin is also problematic. Compounding the DRC’s longstanding issues is the fact that the majority of the energy produced by Inga-3 will be exported to South Africa, while a sizeable chunk of the remainder will only benefit the local mining industry. However, this is where the issue (in theory) becomes less problematic. The DRC would stand to gain substantial economic benefits from its energy exports, while its domestic mining industry has been unable to develop new projects because of a lack of energy. The largest remaining problem would be ensuring that the funds generated would be used properly by the national government. Despite the many hurdles, Inga would represent one of the most significant international collaborations on the African continent, and between the U.S. and China to boot. The energy generated would obviously have a positive impact on international mining and development projects in the surrounding Central African region. A significant source of stable energy would be a development boon for the surrounding countries. For the U.S. and China, there is no question that their investments would benefit from a stable and substantial supply of electricity in a part of the world where dependable energy sources and grids are in short supply. While the two may find themselves at odds in building and maintaining their respective spheres of influence elsewhere in Africa, Inga-3 is a unique opportunity to collaborate and enhance ties in the region, assuming the hurdles of corruption and environmental degradation are overcome. Insights from U.S. Ambassador Cameron Hume.